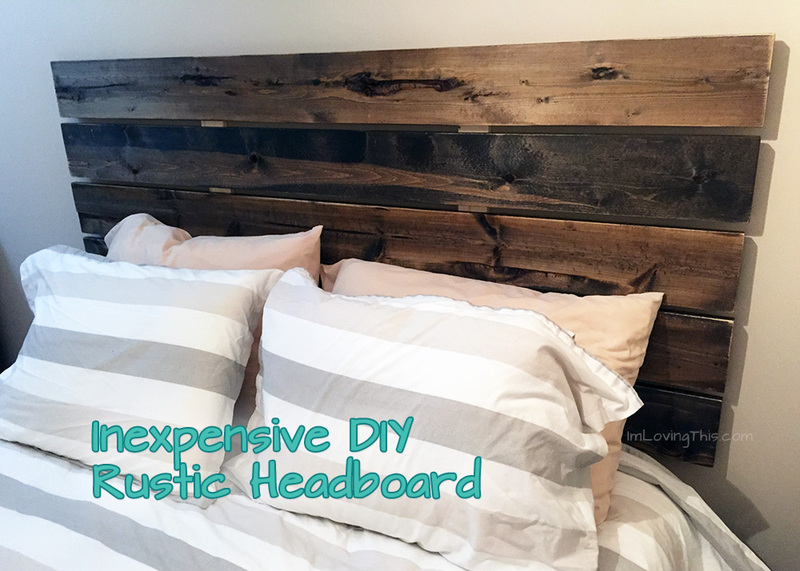 I’ve been wanting a headboard for quite some time for my place in Vancouver. But I didn’t want to spend $300 on a headboard when I’m rarely there. My boyfriend is quite handy and while he was visiting I asked him if he could help me build one. 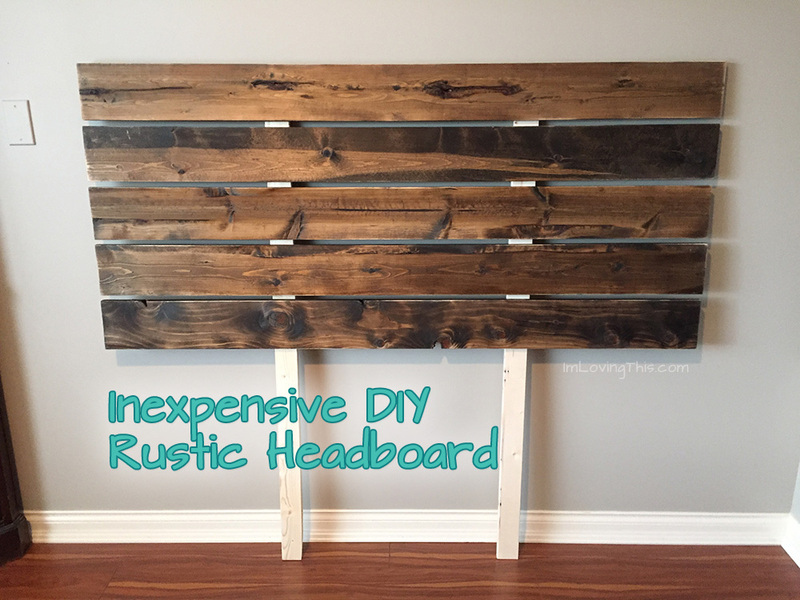 I wanted to do it fairly inexpensively but didn’t want it to look too cheap. We decided to pick out some pieces of pine as it has character. If you are on a smaller budget you could use just plain 2×4’s or 2×6’s. We decided on 5 pieces, cause I wanted it to be able to see it over my pillows and also take up some wall space. 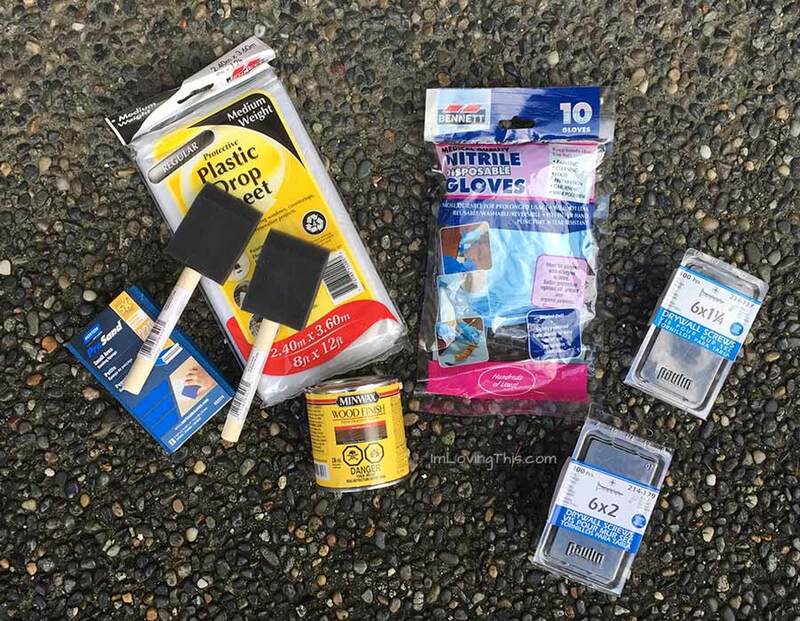 We also picked up a plastic drop sheet to cover the garage floor, some screws, sanding sponge, gloves and two foam brushes. I had to buy two huge boxes of screws cause I didn’t have any but you might have some on hand that you can use. I had to decide on a stain for the wood and went with Minwax Wood Finish in Jacobean. I think the colour worked out beautifully, and glad my boyfriend suggested the colour to me. We were building the headboard for a queen bed, so make sure to measure according to your mattress. First we cut the 6 footers of pine down to 5 1/2 feet. We made them hang a few inches over both sides of the bed. Next we sanded the two edges of each piece slightly just to smooth them out. Don’t over sand as you want it to look rustic, not fabricated in a factory. We then put the chopped off pieces onto the floor and laid the pieces of pine across them so we could stain them. 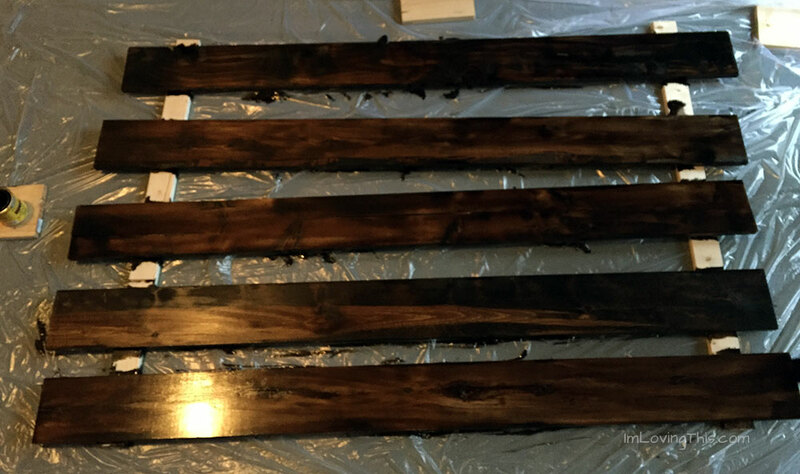 It is easier to stain the edges when they are propped up on the floor. We took the stain and brushed one coat onto the pine wood with the foam brush. Then we wiped it off with a old rag. Sorry the pictures are crap the lighting was horrible in the garage and it was raining outside. After that we waited for it to dry completely. It actually took a few days because it was so damp, I was so anxious to put it together. Once it was dry, it was time to sand. I let my boyfriend do most of the work as he knows what I like and is good at this kinda of stuff. He sanded down the edges of the wood to give it a ‘worn’ look. He also did the edges, length wise, just slightly. Continue sanding until you get your desired looked. We had to cut down the 1 x 3 x 8’s to our desired height which was around 5 feet. You have to figure out how high you want it in order to make the cuts. Each headboard will have different measurements depending on the bed. I wanted the headboard to start right above my mattress. Once you cut down the “stand” pieces it’s time to start screwing. We screwed in from the back so no screws would show. We put in 4 screws per plank for a total of 20. I wanted a slight gap in between each piece of wood. To measure the gaps between each piece we used the handle of the foam brush. It worked perfectly. Now that the headboard is complete it’s time to mount it to the wall. This part is optional. You could also try mounting it to your bedframe. We just screwed in one screw on each supporting piece into the wall with the 6 x 2 drywall screws. You could do four if you want but two worked for me. You can always add more later. Less holes in the wall, the better. Purchase only the screws you require. I bought 2 boxes of 100 when my project only required 22 screws. 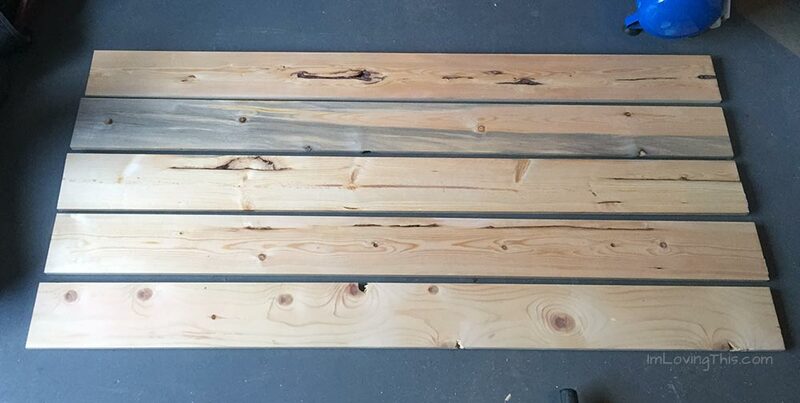 Use different wood such as standard 2 x 4’s or 2 x 6’s. 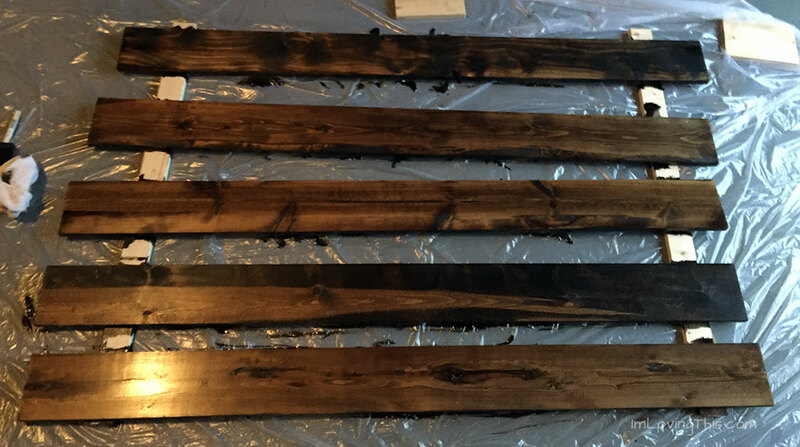 Don’t stain your wood, or use stain you have on hand. Here is the supply list for the headboard again for you without the pricing breakdown.